This is the Seattle Beer News list of the Top 10 Beer Spots in Seattle. Many great bars, pubs, and breweries won’t make this list; that doesn’t mean they aren’t outstanding places. Check out the previous post for #4. For having only been in business since 2008, Naked City Brewery & Taphouse has earned quite a reputation in such a short amount of time. They started out strictly as a taphouse serving beer brewed elsewhere, but they eventually began pouring their own house-brewed beers in late 2009. Located near the busy neighborhood of 85th and Greenwood Ave, they have helped to fill what was a glaring need for good beer in that immediate location. The Beer: Naked City does a great job of focusing on beer from the northwest and West coast, while still mixing in offerings from all over the map to fill out their 24 taps. They usually have several of their own house-brewed beers on tap at any given time, such as Spark in the Dark Smoked Porter, Hoptrocity and The Big Lebrewski. They have frequent brewers nights and special events, and they tap special casks each Thursday night at 4pm. They do a great job of always having an interesting variety of beers on tap. A few of the gems currently on their tap list include Midnight Sun Mayhem, Snipes Zombie Killer, Big Sky Coffee Cowboy Porter, and Fish Tale 10 Squared Anniversary Ale. One thing us beer geeks love about Naked City is their real-time tap list updates. They are constantly updating their website and Twitter feed with beers when they go on tap, as well as upcoming beers that will go on tap in the future. Pair that with an updated chalkboard and tap list printouts at the bar, and they are setting an example for other beer bars and breweries to follow. The Food: The food options range from simple appetizers, to soups, salads, and sandwiches. They use fresh and local ingredients, and there are several healthy options to offset the beer calories. There are multiple vegan options as well. I’ve had some good meals here, but beer will always be the focus at Naked City. More often than not, I just grab one of their hot pretzels served with an amazing dipping sauce that is a blend of Tillamook cheddar, Dijon mustard, and porter. The Atmosphere: Naked City is one of those places that manages to be welcoming to both the 21+ crowd looking to have a relaxed beer, as well as local families stopping in for a weeknight dinner and a couple beers for mom & dad. Even when all the seats are taken, the bar layout is set up to accommodate quite a few standing room only patrons, which comes in handy on weekends and for special events. There are a couple TVs usually turned to either sports or old movies. Service is efficient, friendly, and knowledgeable. If either of the owners (“The Dons”) are around, they are usually more than happy to talk beer. Overall: Naked City hit on a pretty perfect business model for rolling out their business. Breweries can be slow to ramp up, and they fixed that problem by focusing on guest beers at first. Boy, did they hit on something big. 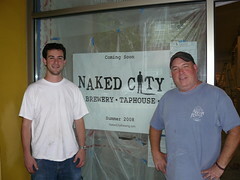 Since rolling out their own beers to complete their plan, Naked City has become quite a special place that has become a favorite of many locals.